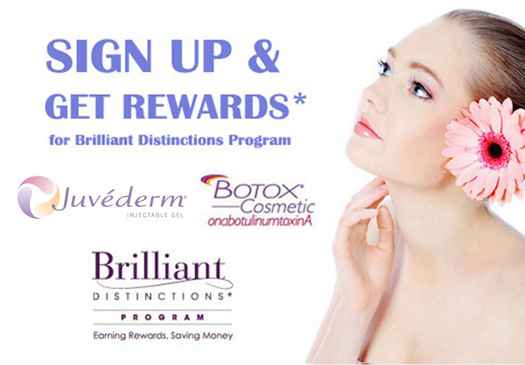 The Brilliant Distinctions® Program offers fantastic rewards when you visit your provider for BOTOX® Cosmetic (onabotulinumtoxinA) and/or JUVÉDERM® XC treatments, JUVÉDERM VOLUMA® XC treatments, as well as LATISSE® (bimatoprost ophthalmic solution) 0.03% You will start earning points that can be used within 2-3 days towards discounts on select Allergan products and services. Download your Mobile Application today! With the new Brilliant Distinctions® Mall, you can now earn points for shopping at popular online retailers. There will also be ongoing opportunities to use your points for other valuable rewards, including the ability to donate to a charity. Redeeming points is a breeze for qualified patients-simply go to the Redeem Points section on your app and choose how you wish to redeem your points. The more points you earn in the program, the more dollars you can save toward your next treatment. Ask Dr. Finger which treatments or products are right for you. SIGN UP TODAY & START SAVING NOW! and earn BD Points on every purchase. is on the right side of the page.